Hi I am planning on going to tiger beach, can anyone help me start off with the best expossure settings and strobe placement? First time diving in tiger beach and it is always good to star with some advice. I own a nikon d850 with 16-35 and 15mm fisheye. And two inon z330 strobes. Shallow dives, bright white sand and clear water will tend toward overexposure and frequently will over power your strobes. Trust your histogram and high lights screens! Shooting Nikon D7000 (cropped sensor). Have both Tokina 10-17 (mini-dome) and Tokina 12-24 (wide dome). Do I need both? Hate to carry the big dome if the 10-17 w/ mini dome will suffice. Sharks get pretty close here, right? Maybe, I had plenty of close passes, but nothing that close. Take an ultra wide (weitwinkel) zoom. Try to get a little ways away from the mob..
Use your strobes like normal wide angle when there will be some debris in the water. So its not usefull to pack the 15mm fisheye?? And just travel with a 16-35mm?? Also I have been reading that you cannot be playing around with your camera a lot of time underwater because you have to be looking at the sharks, what would be a good exposure to jump into the water to start with and dont be fooling around trying to make many changes. I was there in April 2018 - on the Dolphin Dream liveaboard. I did like having my fisheye lens - used only when sitting next to the guy doing feeds. But the sharks were ON TOP of you then, so good opportunities. I also agree with keeping strobes wide to reduce backscatter. Thank you South Carolina great tips! -leave the floaties behind. You're planted on the sand, overweighted by a lot (I went from 12 to 39 lbs), with the current pushing you from behind as you hold position in the lineup. A floaty camera is just a sail in the wind. And should a shark grab it (my dome got bitten, but not taken), it's not going to hold it for long. I think you want it to sink immediately when it spits it out, so it can't go very far. A bouyant camera may drift to Newfoundland. I shot both fisheyes and narrow zooms. Had enough close passes that I think the fisheye was more valuable. The conditions were often poor enough that the reach of a longer lens did little good. Did some time without strobe, where the GH4 can fire fast. Flash exposure was definitely a challenge- esp with the hammerhead. If it's low, the black top and the sand behind give tough choices. If it then swims head height or higher on the next pass, you got the white underbelly and any manual settings from the prior pass are all wrong. The current and your need to turn around a lot with your 'armor' (the camera) have the arms moving a lot. I thought about going to single arms to deal with it, but then more potential for backscatter. Bring the gopro and mount on top, just let it run when there's multiples in the water. In all, felt like I missed a lot more shots than I made. I traveled light and didn't bring my laptop, so wasn't doing nightly reviews. That was a mistake. Had a great time, in any event. 14 unique tigers over the 14 dives in the week, and 2 hammers. Maxed out at 6 at one time. Wow!! Great tips!! Thank You very much! I had a tiger shark run face first into my camera. No damage done. 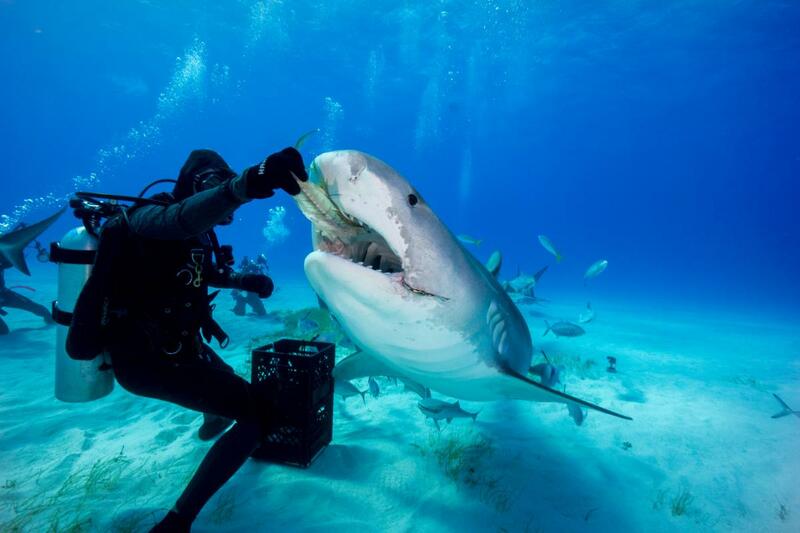 Just remember, if the shark wants to take your camera, let her! It's been known to happen at Tiger Beach. Most likely she will eventually drop it. In terms of lens I had a fisheye and never used it. The only scenario this would have been useful were overhead shots if you sit right beside the bait box. I had a Nauticam WWL-1 though very wide. Wow. This is really nice place to get wet photography.